Woodchester Storage Limited offers domestic and business storage in Minchinhampton, Stroud and surrounding areas of Gloucestershire. 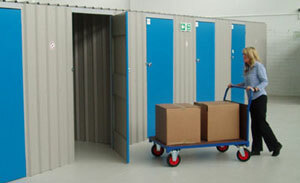 We provide clean, dry, secure storage rooms in a variety of sizes, ranging from 30 to 100 sq. feet. Length of stay is a minimum of one calendar month. Free insurance to a total value of £2,500 is included. Additional insurance can also be arranged as required. Our clean, secure storage facilites and helpful, professional staff will ensure that you and your property receive the best possible service and value for money storage in the Stroud area. We have a network of local "man & van" contacts who could assist with your move. Please call or ask for details. Secure, professional, flexible and affordable - make Woodchester Storage Limited your first choice for household and business storage in Minchinhampton and Stroud.